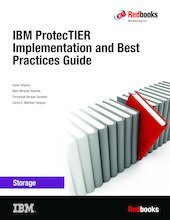 This IBM® Redbooks® publication provides best practice guidance for planning, installing, configuring, and employing the IBM TS7600 ProtecTIER® family of products. It provides the latest best practices for the practical application of ProtecTIER Software Version 3.4. This latest release introduces the new ProtecTIER Enterprise Edition TS7650G DD6 model high performance server. This book also includes information about the revolutionary and patented IBM HyperFactor® deduplication engine, along with other data storage efficiency techniques, such as compression and defragmentation. The IBM System Storage® TS7650G ProtecTIER Deduplication Gateway and the IBM System Storage TS7620 ProtecTIER Deduplication Appliance Express are disk-based data storage systems: The Virtual Tape Library (VTL) interface is the foundation of ProtecTIER and emulates traditional automated tape libraries. For your existing ProtecTIER solution, this guide provides best practices and suggestions to boost the performance and the effectiveness of data deduplication with regards to your application platforms for your VTL and FSI (systems prior to version 3.4). When you build a ProtecTIER data deduplication environment, this guide can help IT architects and solution designers plan for the best option and scenario for data deduplication for their environments. This book can help you optimize your deduplication ratio, while reducing the hardware, power and cooling, and management costs. This Redbooks publication provides expertise that was gained from an IBM ProtecTIER System Client Technical Specialist (CTS), Development, and Quality Assurance teams. This planning should be done by the Sales Representative or IBM Business Partner, with the help of an IBM System CTS or IBM Solution Architect.